The end of June marks the end of the school year for Canadians. If Lydia would have been in traditional school, she’d be finishing up first grade right now. As most of you know, we unschool, so we just live life and learn along the way, allowing her to follow her interests and facilitating her education by providing a rich learning environment. I thought I’d take some time to reflect on what we did over the last school year. I’ve divided things up into rough subject categories, though of course learning doesn’t happen like that in real life. (I did the same thing last year, if you’d like to read what we did during her “kindergarten” year). We continued to mostly avoid anything particularly “academic,” since she simply wasn’t interested in it, and because my research has led me to feel it’s unnecessary at best (and harmful at worst) to push academics before the age of seven. We’ll see what we do next year. I like to cover this one first, since this topic is one that folks seem to worry about most when it comes to homeschooled kids. Lydia typically spent at least four days a week with at least one other kid besides her baby brother. Mondays were spent at her grandma’s with her younger boy cousin; Tuesdays and Wednesdays were shared with her best girl friend; and Friday mornings were spent with our large and diverse homeschool group. The kids got a chance to swim at the beach, play at different parks, and visit back yards and farms. She also went to forest school and swim lessons at various times throughout the year. We went on a ton of field trips with our homeschool group, and did a Valentine’s Day exchange in February. I am so thrilled with the group we’ve found this year, I couldn’t ask for better. Speaking of field trips: I felt like these outings were terrific both for learning opportunities and to nurture a general sense of community. 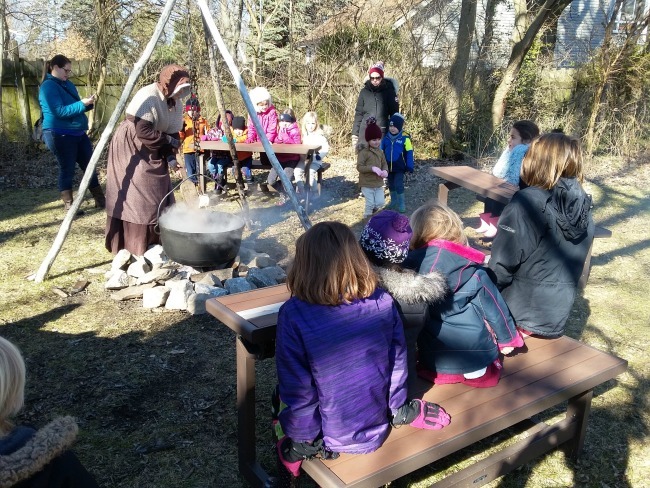 We went to a pioneer homestead on multiple occasions to learn about how life was lived over a hundred years ago. 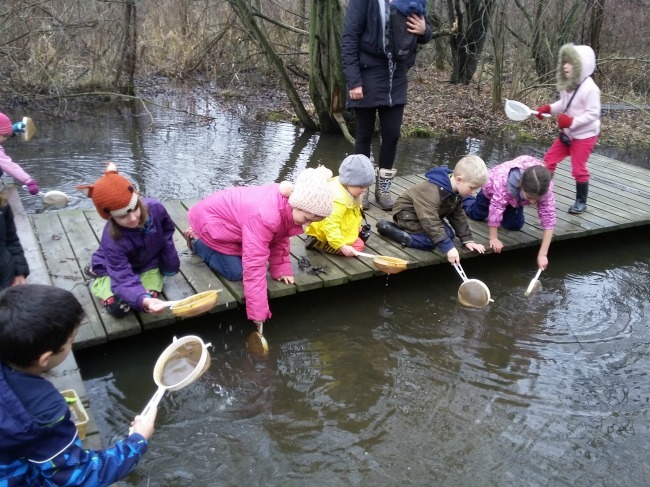 We went to a local marsh to learn about wetland habitats. We visited the local Historical Aircraft Association to see and learn about WWII planes. 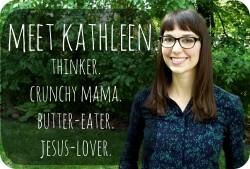 Again: I am SO, SO GRATEFUL for our homeschooling community this year! Math mostly took the form of everyday addition and subtraction. It was mostly explored orally, in response to real-life scenarios. (This is a fancy way of saying that when numbers came up in real life, we worked through problems aloud.) We briefly visited the concept of multiplication a few times, and I bribed her with chewing gum to fill out a 1-100 chart, just to prove to both of us that she could do it. We also spent a few hours on the Khan Academy website, just to learn about written formulas. I feel we probably caught up on a full year’s-worth of lessons in about three combined hours. It helped me feel more relaxed about her math situation. She didn’t love it, though, so I kept it to a minimum. One resource she loved was the book Amazing Visual Math. She spent a lot of time poring over the geometric shapes and movable charts. I highly recommend it. I think it will be very educational when she can read. Lydia was still not really interested in learning to read this year, which is fine. However, I must mention that one week in May, I got her to try the free educational computer game Teach Your Monster to Read, and she played obsessively for about three days. The progress she made was astronomical. She went from barely being able to name the sounds of individual letters to being able to read short sentences in less than 48 hours. Demonstrating, once again, that learning does not naturally happen in a linear or evenly-paced fashion. Most kids can probably learn in a few hours or days — when they’re ready and self-motivated — what they would traditionally be taught over the span of weeks or months in school. But even though she didn’t want reading lessons, that doesn’t mean her literacy education was completely ignored! We spent lots of time reading chapter books aloud. In this way she learned things like vocabulary, sentence structure, and story structure; and most importantly, she is learning to love stories and language. Lydia is a natural-born artist, so I don’t need to do much here but make sure she’s stocked with supplies. She literally spends hours every day drawing. 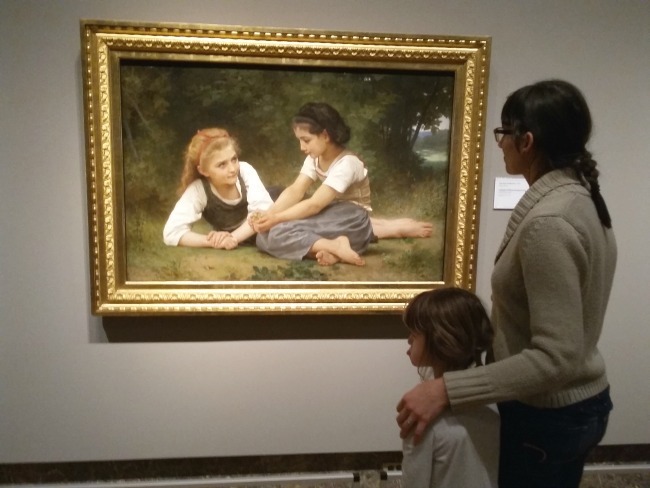 We loved two books that I highly recommend: The Art Book for Children and Get Into Art: People. Both books introduce kids to influential artists in an accessible way. She can now recognize the works of Picasso or Arcimboldo thanks to these books, and they’ve inspired her to try new methods and materials. 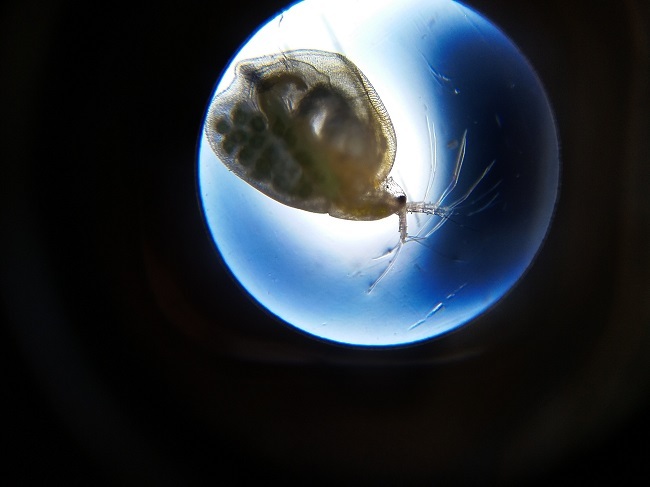 Our microscope got lots of use this year (I wrote a whole post about it a few months ago). We especially enjoyed looking at bacteria and fungus colonies; microscopic pond creatures; and snowflakes. 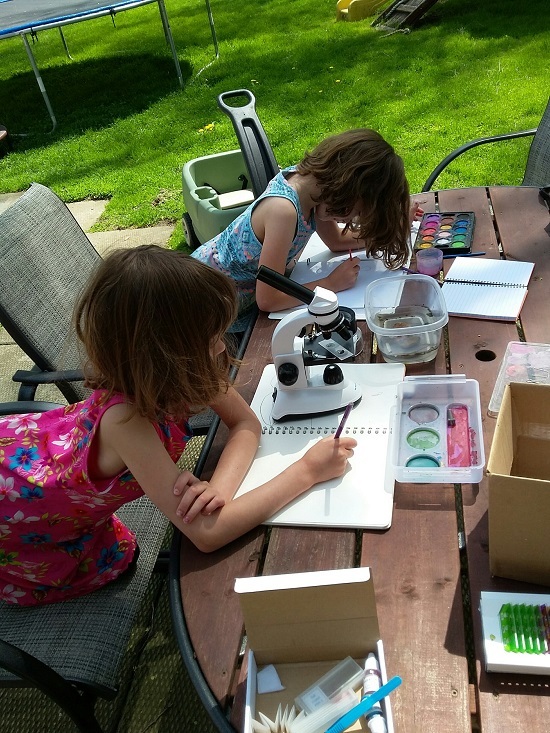 We did a bit of nature journaling during the warmer months. I set up some science demonstrations, like creating sugar crystals, and using red cabbage juice to test pH levels (so cool! I wrote about it here!) She was inspired to try some of her own science experiments. Ummm . . . we listened obsessively to The Greatest Showman soundtrack? And she watched hours and hours of Lindsey Stirling’s videos on Youtube? She recently became interested in playing the xylophone, and was very proud when she taught herself to play Twinkle Twinkle on it. Even though she’s already an “amazing” dancer, I’m thinking about signing her up for tap lessons in the fall. We read and really enjoyed the first half of The Story of the World, where we covered early nomadic cultures, through the Egyptian, Persian, Greek and Roman empires. 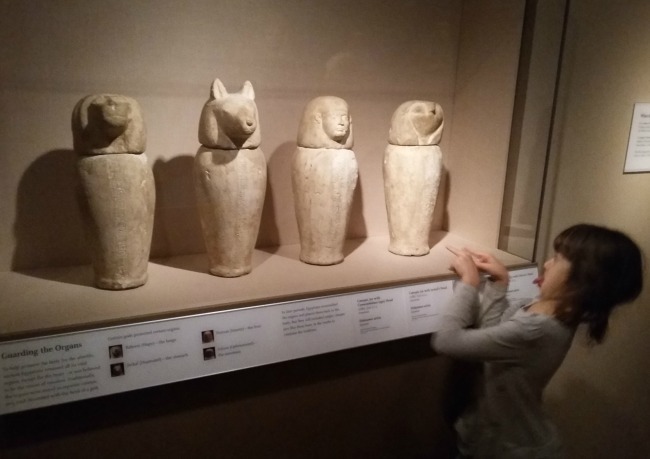 She particularly enjoyed learning about the Egyptians, and was excited to see the Egyptian displays the the Detroit Institute of Arts. In the warmer months, she got lots of time playing unsupervised in the back yard, swinging and climbing. We also walk as a family regularly to the library, local restaurants, etc. 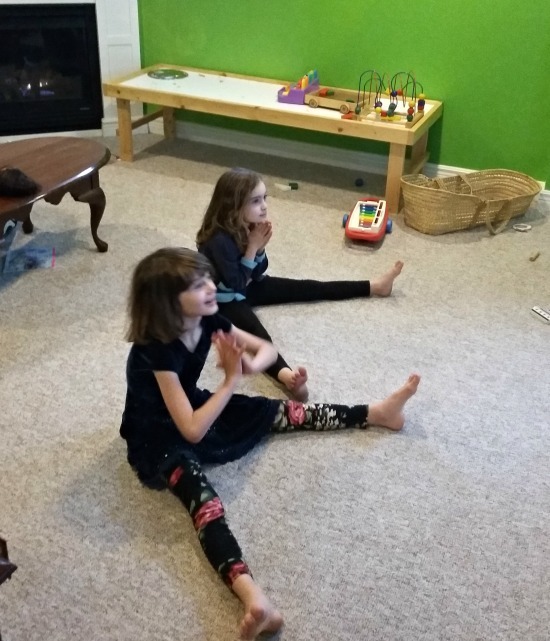 During winter she really enjoyed Cosmic Kids Yoga on Youtube. Well, I think that covers all the big stuff! Thanks for sticking around, and I wish you a relaxing summer! *This post contains affiliate links. Thanks for supporting Becoming Peculiar! Thanks so much for sharing- really interesting. Thanks for all the tips and resources! Can I ask how old Lydia is? I’m wondering what Kindergarten/First Grade in Canada relates to in terms of Reception/Year 1 in the UK. She’s 6, turning 7 this summer. I just took it for granted that everyone called them the same thing!